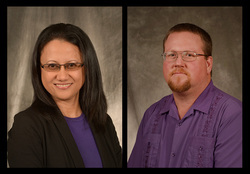 NACOGDOCHES, Texas - Two outstanding Stephen F. Austin State University faculty members will be honored during the 30th annual SFA Gala Saturday, Dec. 8, in the Baker Pattillo Student Center Grand Ballroom. Faculty achievement awards presented during the Gala recognize innovation and excellence in teaching and research. Dr. Sheryll Jerez, associate professor of environmental science in the Arthur Temple College of Forestry and Agriculture, is the recipient of the 2018 Faculty Achievement Award for Teaching. Dr. Kevin W. Stafford, associate professor in SFA's Department of Geology in the College of Sciences and Mathematics, is the recipient of the 2018 Faculty Achievement Award for Research. In her courses, Jerez designs and implements student projects based on real-world environmental issues that are presented during the Undergraduate Research Conference at SFA and at professional meetings throughout the United States. One student shared the following about Jerez in a course evaluation, "Dr. Jerez was by far the most prepared, organized, knowledgeable and enthusiastic professor. She is excellent in sharing her knowledge and helping her students understand the principles." According to colleague Dr. David Kulhavy, Laurence C. Walker Distinguished Professor, Jerez's ability to translate the academic material into everyday life prepares the students she mentors for the rigorous environmental science profession. "Dr. Jerez is known as 'the professor with the cool toys' because she uses them not only for demonstrations but also, and more importantly, to help her students understand science," Kulhavy said. "Students leave her courses with the skills they will use in their careers." Jerez is an effective researcher, as well, conducting externally funded research on improving air quality in the poultry industry. Much of her research has been published in peer-reviewed journals. Additionally, she has supervised dozens of Master of Science thesis projects, including several completed by university scholars, and she has served on numerous graduate committees. In 2016, one of her graduate students received the Best Graduate Student Presentation Award at the SFA Bright Ideas Conference. "Dr. Jerez is extremely active in professional societies, especially the American Society of Agricultural and Biological Engineers, where she served in many capacities, including associate editor and reviewer for publications," said Dr. Kenneth W. Farrish, director of SFA's Division of Environmental Science. "I firmly believe her contributions to SFA's environmental science program have been major factors in achieving the great reputation our programs have with employers, which has led to a nearly 100-percent employment rate for our graduates," Farrish said. Colleagues recognize her as one of the most innovative faculty members in the college. "Dr. Jerez is constantly staying ahead of industry changes and improving the environmental science program curriculum to stay current and relevant in this rapidly evolving field," said Dr. Matthew McBroom, associate dean and professor of forestry. "She effectively trains her students both academically and professionally. Her remarkable enthusiasm, diligence and pursuit of academic excellence have helped to grow SFA's environmental science program to national recognition." "Dr. Stafford is routinely invited to prepare scholarly papers and book chapters related to these topics at both the national and international levels. He also is often requested to give presentations at regional, national and international meetings," Brown said. Stafford is an accomplished researcher with approximately 66 publications and 114 conference abstracts. He has advised 17 thesis students through their respective research experiences to completion. Stafford has been the recipient of 14 research grant awards totaling approximately $950,000. Currently, Stafford is working with the Texas Department of Transportation on a new grant proposal that is expected to total between $850,000 and $1.4 million in additional funding. Furthermore, Stafford has authored 20 and co-authored 13 peer-reviewed scholarly journals and book chapters. He has written one book on karst resources of Central Texas and edited three additional books related to karst hydrogeology. He also has authored or co-authored more than 50 conference presentations while affiliated with SFA and four technical reports. In the past academic year alone, Stafford was senior author on five peer-reviewed articles and senior editor for a scholarly book titled "Hypogene Karst of Texas," which was published by the Texas Speleological Survey. Stafford shares his love for research with his students, pushing them to stretch and advance beyond what they thought they could. He has effectively mentored his students by encouraging them to be lead author on his publications and presentations. "Dr. Stafford is convinced that his reputation as an educator-researcher is enhanced when his students are able to not only get the job done in the field but also are able to analyze and write these results for technical audiences," said McBroom, who has worked alongside Stafford on numerous research projects and graduate student theses. "His excellence in research is demonstrated by the fact that he was awarded SFA's Senior Faculty Research Distinguished Grant Award in 2017 in addition to the Silver Level Distinguished Grant Award that same year. He also has been recognized outside SFA by the National Cave and Karst Research Institute with a Meritorious Service Award in 2011," McBroom said. The Gala cocktail reception begins at 6 p.m. and will be followed by dinner at 7 p.m. Entertainment will be provided by Hot Sauce of Austin, featuring music from the 60s, 70s, 80s and 90s, and ranging from pop and rock to rhythm and blues. Tickets are $175 for orchestra seating and $125 for ballroom seating. Proceeds from the Gala help build a permanent endowment created by the SFASU Foundation to honor faculty member achievement. For more information or to purchase tickets, call April Smith, associate director of development, at (936) 468-5406.